After yesterday's awesome (mind-blowing!) technical flight sim I needed something a little less taxing on my old brain cells so I'm taking an easier route and playing a Pac-Man clone. Many come with tons of bells and whistles but here is one of a more traditional variety so let's get pill-popping and ghost munching! Mac Pan was released in 1987 by Richard Beith and only works in the crisp ST High resolution. There are a few integrated features which I really did like: hold down the fire button and you can temporally increase the yellow guy's speed, the game's speed can be tinkered to your own preference and it also has support for simultaneous 2-players. The graphics are cutely vintage but the waka waka waka sound effects aren't going to blow you away... 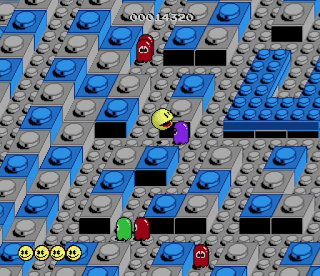 It's not the best PacMan game I've played but I still enjoyed it and being able to choose the game's speed is a superb idea. It's easy to imagine German office workers in the 80/90s playing Mac Pan during their lunch break. Monochrome users should jump up and down with excitement because this is an excellent clone of the old classic. - Apparently, the game has a cheat mode but I've never found it. Can you? This morning I dug out an old friend, ProFlight by Nick Brown of HiSoft, and jumped inside my Panavia Tornado to take it for a spin - Maverick style. It runs fine on any Atari ST but will certainly benefit from faster computers: my Mega STE delivers astounding framerates so I do wonder how a Falcon or TT might perform... ProFlight works in colour but, unlike a lot of games, it's also fully compatible with ST High which I preferred to the blockier option. Now, I do remember labouring over ProFlight back in the day and today I wondered how my older (and wiser?) brain would cope with this monster flight simulator. The main emphasis is on simulated realism so you're out of luck if you thought this was an arcade-style combat shooter. However, that doesn't mean it's all work and no play because, once you've got over the hefty learning curve, there is an enjoyable and rewarding experience to be had. Man, this is such a professional product and one that comes as a massive box with such a weighty manual - it's like something from real flight school training! Yes, this is an incredible flight sim for techie gurus to drool over and certainly one of the most rewarding sims I have ever played. HiSoft are trusting you with their precious plane which can be flown using either a floppy disk or your hard drive. Please be careful and don't crash it!! Isn't Diamond Edge a brilliant program? 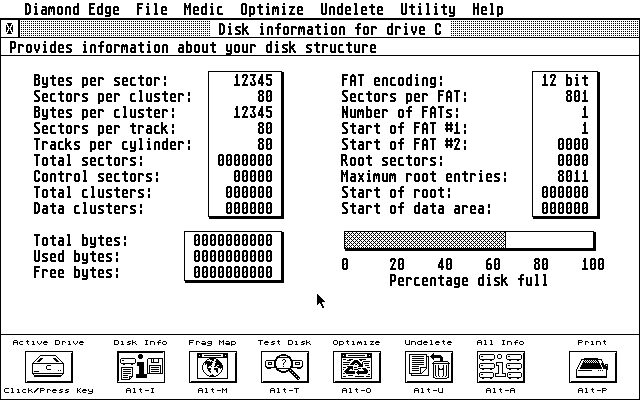 One of its features is called Test Disk which scans for various types of potential problems. Only the other day this saved my bacon because Drive C (a 32MB partition) suddenly reported itself at 22MB. Why I do not know, but Diamond Edge came to the rescue and fixed several serious issues. Nothing was lost and the drive is working 100% again... (phew!!!). I have also found it particularly useful to optimise (defrag) the partitions in order to better stream audio for (storage) demanding games (Cannon Fodder / Xenon II) or other programs like ST Video Player. I try and defrag the drives on a monthly basis. Don't even get me started with Undelete, another superb part of the Diamond Edge suit! 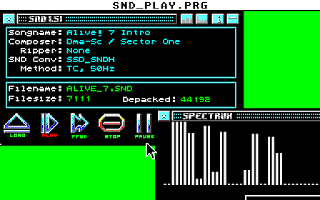 Diamond Edge is one of the most fundamental utilities for all Atari computers. It's as essential today as it was back in the day - every machine equipped with a mass-storage device should have it installed. Anodyne has Diamond Edge all ready to download with a manual too! 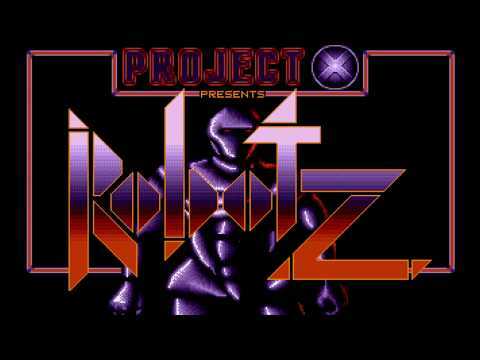 Tons of Atari ST games run in high resolution and one of the best is Bolo, a Breakout clone. It takes the familiar concept and improves upon it tremendously with lots of extra features, like the ability to move the bat almost anywhere you like. There are also gravitational effects which are cunningly effective and also different brick types and the ability to change the physics of the ball's speed and direction. Yep, Bolo is an awesome brick-blaster!! 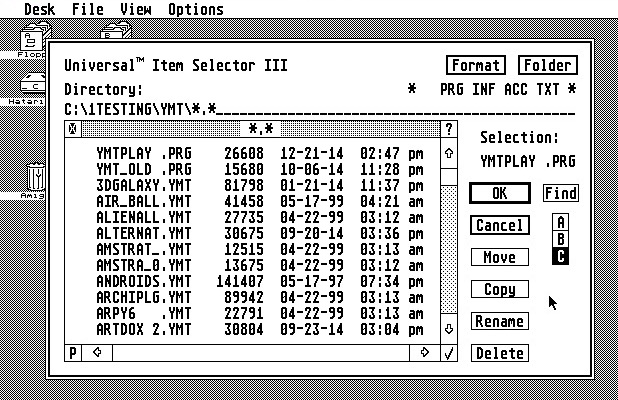 SysInfo is an incredibly useful utility that can display a whole raft of useful details. It has recently helped me diagnose an issue I had with the audio hardware of my Mega STE not being detected. This is a fantastic must-have utility which is able to tell you just about everything you will ever need to know about your own computer. Everything from your TOS/GEM config through to more technical aspects like the Cookie Jar, VBL, traps & other mind-boggling jargon! 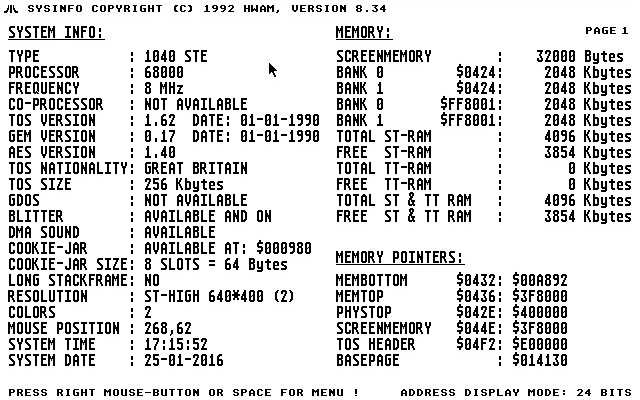 Download SysInfo from "Atari ST Essential software (The List)" which is a brilliant website. Maggie 25th Anniversary issue was released this weekend! 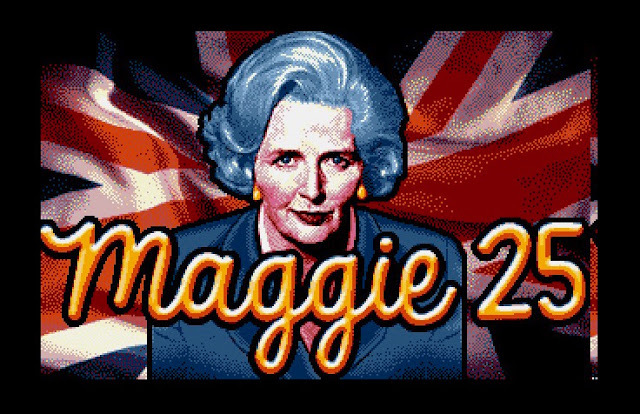 - Maggie for Atari computers. - An offline HTML version to download. - Their website to read right now! - The Maggie Team on Demozoo. 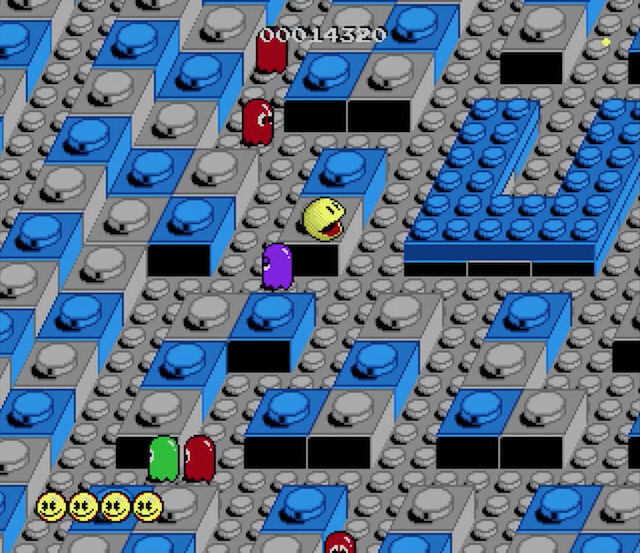 Andrei Ellman, Wacko Software, created a game which mixes three classics together: Pong, Space Invaders and Pac-Man. However, with a cunning twist, all three are simultaneously playable using the one joystick. You heard correctly and the controls are pretty insane: Pong is controlled by holding down the fire button and then moving up/down. 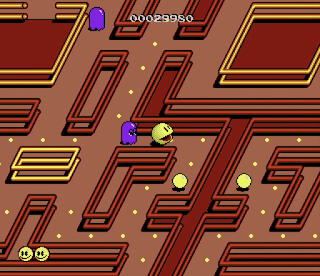 Pac-Man is initially very confusing so I advise you read the docs but Space Invaders has the most simplistic controls - left/right moves your ship and pushing up or down will fire your weapon. Weird, right? 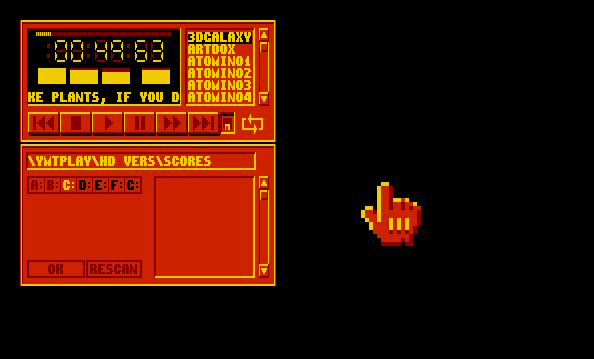 The controls sure appear tricky but, with a little practice, will oddly work pretty well. 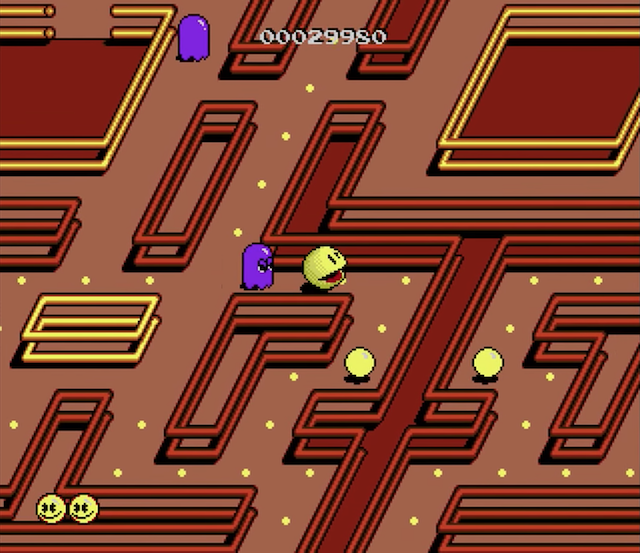 However, there's only so much my tiny brain could manage and I found myself concentrating more on Space Invaders whilst occasionally playing Pac-Man. Scarcely did I bother with Pong - not until I had died in one of the other two games. If things are visually too messy then you could invert the colours by pressing the "I" key which looks ugly but is better on the eyes. 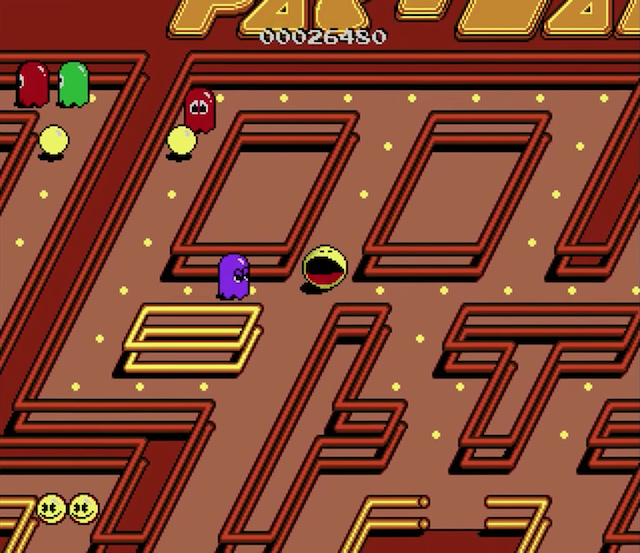 Also, the numerical keypad can brighten or darken colours certain colours from each game - pressing "9" a few times will brighten Space Invaders whereas "5" will darken PacMan. I think Andrei was one crazy, mixed-up kid and probably had a good laugh when developing this. Don't take it too seriously and practice with the controls because Video Games 1 is ridiculously entertaining and you'll love it. 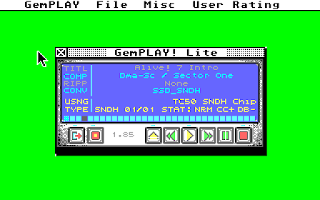 The excellent Universal Item Selector by Application & Design Software, released here in the UK by ST Club, is one of my favourite utilities. The Atari ST has always been blessed with a small, but great, selection of replacement file selectors but UIS is the best of all. Only this weekend did I trudge through a folder containing over 100 tracker mods, deciding which ones to keep or delete, and UIS made the job 100x easier because of its integrated tools. Click here to download this great program with its PDF manual available via Atari Document Archive. 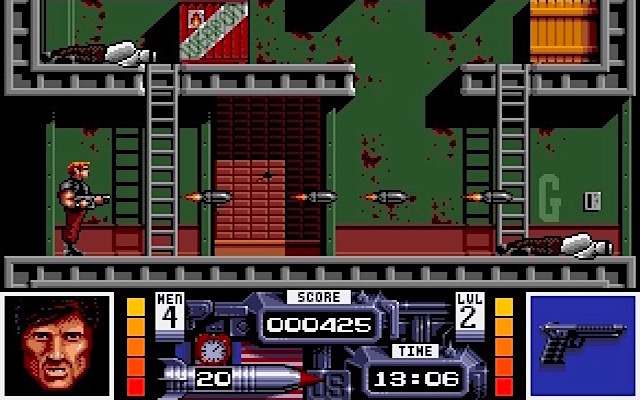 Here is a game with few friends: Navy Seals is deceiving and, first impressions, are of an arcade-style platformer. However, this hidden Ocean gem is anything but a typical run and gun 'em all. It's far more ruthless and requires stealth, tactics and advanced route planning. Extreme personal perseverance is the order of the day!! Taking down scumbag terrorists is all part of the job when you're a member of the fearless US Navy SEALS. Our missing requires us to sneak into the lion's den, kill everyone and plant explosives to destroy their stockpile of missiles. Visually, Navy Seals is a babe with gorgeous great retro graphics. I just love the beautiful character animation as you run, leap, climb and sneak about. 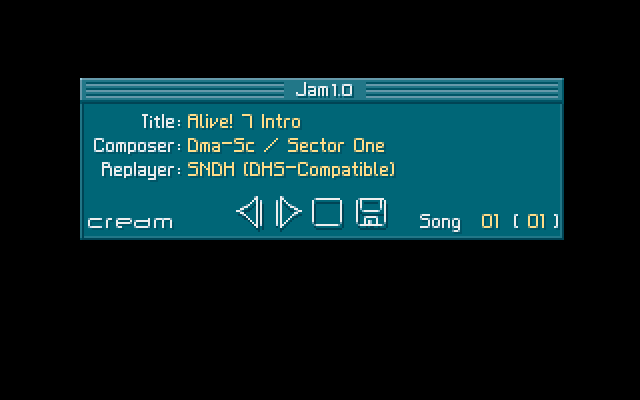 Sound effects do their job very well and the music is a cool chiptune to bop along too. Aesthetically, all is nice but let's get to the nitty-gritty of why it's feared so? Personally, I don't think it should be feared in the slightest but it will require a committed player willing to spend many hours mastering the levels. Each map is a layout of cunning platforms within a maze of trigger-happy bad guys. It's all about covert tactics, so play slowly and carefully to learn where the enemy is located. Many practice games will be required to plan the best route from start to end, this is vital and the only way to successfully complete your mission. There are two drawbacks with Navy Seals. The first is the time limit which I think is too harsh (at least for me) but I also don't understand why Ocean didn't include a way to unlock each level. This doesn't make any sense!! Overall, this is such a difficult game but I also find myself enjoying it too. Each level requires the player to learn all aspects thoroughly, so don't expect a cakewalk! Navy Seals won't appeal to the casual gamer and requires lots of practice (i.e. death!) to figure out an efficient route before the timer expires. Rewarding but incredibly brutal. 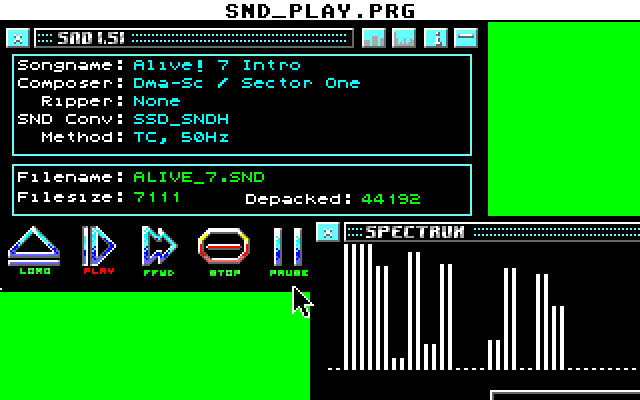 - Hard drive installable versions are available from both D-Bug and 8bitchip. - Floppy disk games can be found using Old Games Finder. > Type in WOZZIE into the high score table to activate the cheat mode. 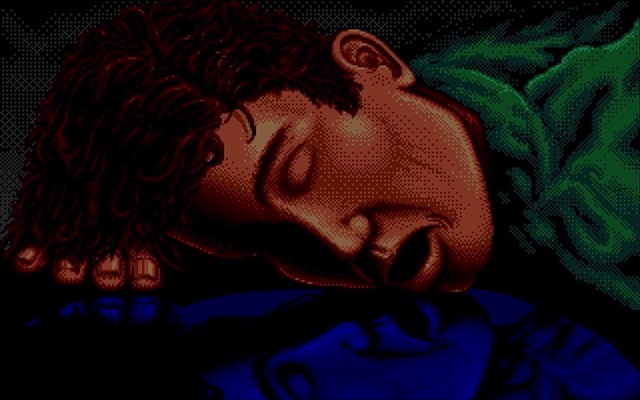 > Begin a new game. Press W for weapons or RETURN to advance onto the next level. > Dawdle when learning the maps - slow and steady wins the race. > Play draft games and make notes of the most efficient route. Exhilarating is the word!!! Tomtar is a freeware shoot 'em up released in 1993 for the Atari STe by UTEN (NewCore, XiA, Toxic Twins & Unit 17). A "tomtar" is basically a gnome and they breed like bacteria so will eventually take over the world unless something is done! We asked the Grim Reaper for help but there are too many for him to handle so we needed divine intervention - in the form of a machine gun!! Yep, we all know where this is going so let's lock and load to help the mythical Reaper destroy all the Tomtars in what I can only describe as the craziest 5 minutes of your life. In the right corner of the screen is an Orch - kill him to advance to the next level. 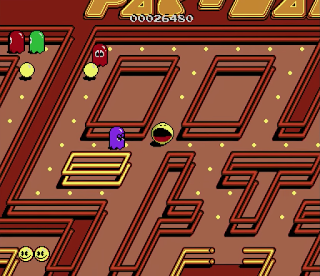 Use the mouse to shoot but beware because this isn't going to be easy because these little critters can walk, run, bounce and fly their way across the screen. Controls work well with the mouse but I would have preferred the right-button to perform another function like throwing a grenade, this would have been superb... Gameplay becomes frantic and more chaotic the further you progress but I must admit that it's a shame the spooky backdrop doesn't change. A stupid game that offers nothing more than a mad few minutes blasting Tomtars and that, I loved. So if you fancy killing these little blighters yourself then grab it from Demozoo (who also have a cutdown STFM version). My high scores are: 78,250 (emulation) and 94,740 (using my Atari STe). What are yours? Can you beat me?? 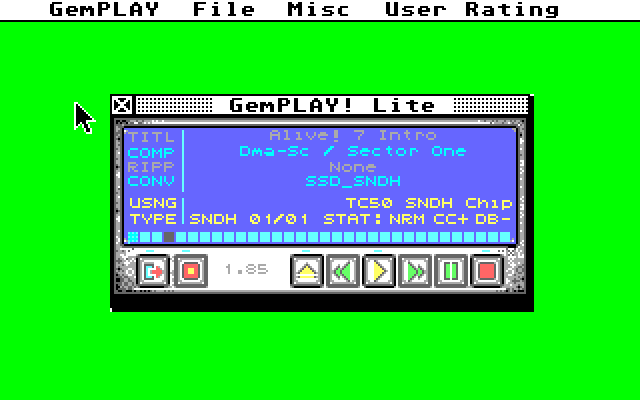 I'm starting off my weekend with the gorgeous Flip-O-Demo by Oxygene/Diamond Design because it has just been updated to support hard drive installation. Originally, it was released in 1993 and contains some of the best artwork and visual fx you could imagine - all whilst playing beautiful audio by one of my favourite musicians. A wonderful Atari ST demo and certainly one of my favourites which you can grab via Demozoo right now. I've always loved Gold Runner which is a technical masterpiece by legend, Steve Bak. He proved when in the hands of a talented programmer, the Atari ST is more than capable to produce wondrous results. Other (lame) programmers would whine and complain but Mr Bak simply got the job done perfectly each and every time. Okay, honest time, I'm actually terrible at this ultra fast-paced shoot 'em up and I was never too fond of that dreaded fuzzy speech. It was fine back in the day and is humorously entertaining but it soon wears thin and distracts me during gameplay... Perhaps I'm just old and grumpy but I've never really liked it. Sorry! Good news - Peter Putnik has updated Goldrunner for hard drive installation and an option to disable the speech!! All you gotta do is press the F3 key so clickety-click and download this sweet update to the ST classic. Don't get yourself all in a twist - hop over these pesky ghosts whenever they get too smart! Well, entering into the 16-Bit arena is Samuel (aka Zamuel_A) with a new upgrade specifically designed to make full use of the Atari STe and its enhanced hardware. Gameplay now takes place using overscan and flows along at 50fps thanks to the hardware scrolling. The Blitter co-processor handles the sprites and the DMA Audio hardware plays all the sampled sound effects with our sweet YM2149 banging out chiptunes - which are far better than Tracker MODs!! Well, I am totally gobsmacked and I'm sure Samuel has utilised every part of the computer? Run! Run! Run!!! He's getting closer! Hurry up, there's no time to yawn!! PacMania has been transformed for the 21st century so it's impossible not to be blown away by Samuel's hard work. 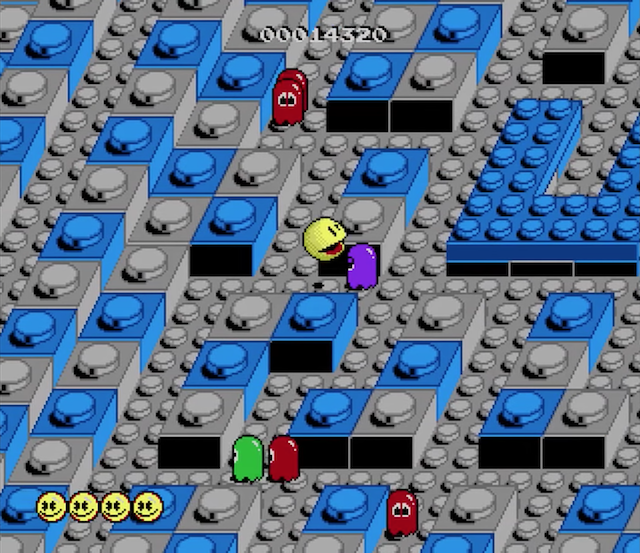 A fascinating revamp of the arcade favourite and now far more enjoyable than ever. Absolutely superb!! The latest version is available directly from Atari-Forum! and here's another video I've recorded. 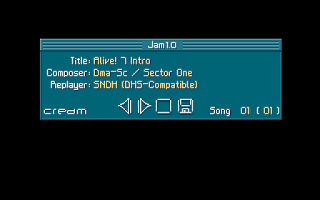 What better way to mark the end of a great Christmas holiday than to listen to some cool chiptunes using YMT Play by the talented demoscener, Peter Jørgensen (aka Bionic Nerd) who is a good mate of mine. His program features YM music data streaming, like the typical ST-sound playback using a sound range from 50hz -> 300hz with little CPU usage. The quality is outstanding and I'm sure you will find YMT Play to be an interesting and an exciting concept. - Download YMT-Play from Demozoo and there are YMT videos on YouTube. - Update: YMT will be the driving force behind the DMA tunes in the new Enduro Racer! 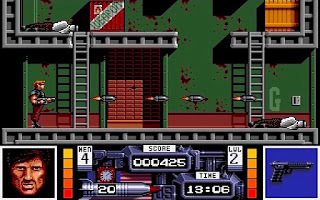 Annihilator features lots of baddies swarming above your spaceship called Insectoids and you need to move left and right to dodge their attacks whilst slamming on your fire button like a crazy fool. There are bosses to battle with and you will be grateful for those infrequent power-ups that replenish your ship's shield or increase its firepower. Does this sound a little familiar? Yes, of course, it does but what it lacks in originality it is compensated by an obviously talented programmer. Annihilator performs more like a quality commercial game with its smooth-as-silk visuals. Annihilator is professionally produced and plays beautifully. Definitely a Crash Smash from me!! 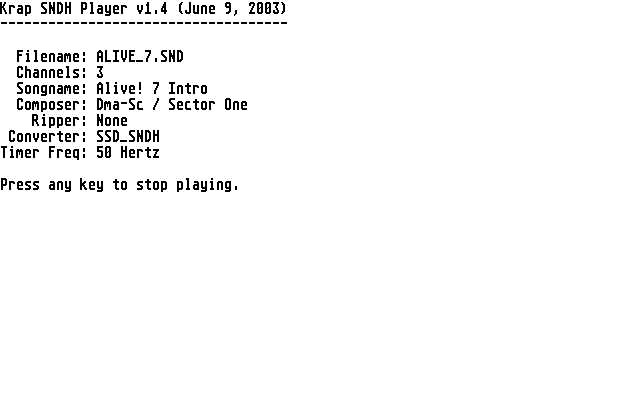 - 8BitChip have a hard drive installable game and floppies are available via Old Games Finder. - Update: We have since interviewed the man himself, Robert HC Leong! - Fancy skipping levels? Pause the game (SPACE) and then hold SHIFT and hit keys F1-F10 for the required level.